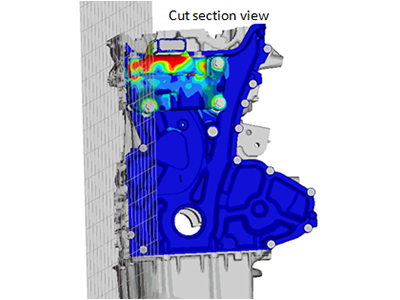 MeshWorks is a multi-disciplinary post-processor for viewing and publishing the results of analysis. It allows for loading and viewing the result files obtained from various solvers. A rich set of post processing features such as animations, contouring, cut section results, iso plotting of results, querying of results values node-by-node or element-by-element etc. are all supported. 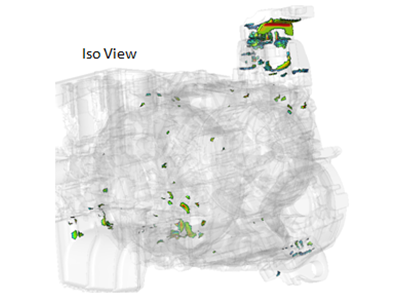 Interactive post-processing features in MW8 allow users to have rich insight into the results and hence the behavior of mechanical systems under operational loads. Several automated post-processing utilities are available for robotic extraction of ‘hot-spot’ results such as peak stress values, max vibration amplitudes etc. 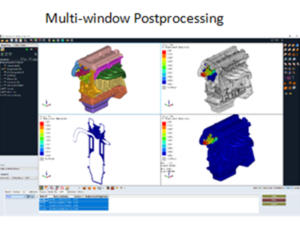 Multi-window post processing of results allows users to easily compare the results of several load cases or several design iterations side by side. Multi-page post processing of results allows users to organize different types of output responses into different pages for easy viewing and navigation. 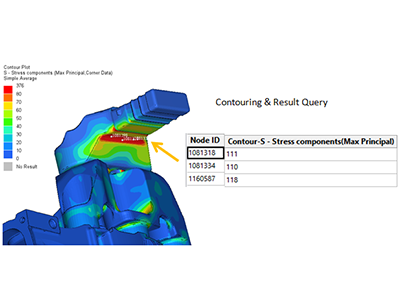 Contour: Allows to create contour plots of a model and visualize the analysis results. ISO: Allows to display iso(or same value) results of the model. Animation: Transient, Linear and Modal animation options are supported. Model Info: Annotations display the model details and users can include notes for additional information as and when needed. Query: Allows users to view and export results of queried nodes, elements & components. Cut Section: Allows user to cut planar sections through a model to view results on internal details of the model. Utilities: Several utilities are used for highly automated post processing of results for Design of Experiments (DOE) and optimization studies. Integrated post-processing user interface within MeshWorks environment. Inclusive of Post Processing results from Abaqus & Nastran solver outputs. Large scale models are handled with ease. Multi- page and multi- window post processing of results with easy ‘cut, copy, paste, apply’ from one window/page to another. Automated ‘Score Card’ module helps in extracting various key results and provides in a user friendly tabular format. XML based session file saving.